UPDATE: "I got in touch with Mr Sujay Pawar at Facebook who is Head Business at the organisation where Amar Sontakke works, I had informed Sujay about this plagiarism issue where he has promised me to look into this matter personally and make sure to let Amar realize how serious plagiarism issue is. I would like to extend my thanks to all folks who contributed and helped me to spread words about this issue. It was just an small incident, but I'll keep continue educate people on how serious plagiarism & content scrapping is. We have to create a better World!" This article is not all by any means intend to hurt any individual's sentiments or discourage them morally, personally or professionally. I thought it would be worth sharing because many of you have also faced such situation in your professional life where some anonymous person has stolen, scrapped or copied (basically Content Theives) your work or taken credit to work/content which you Originally Own. For the first time I am writing some offbeat blog article, it's my request to all of my reader's to hold your breath and read this classic article till end! You must be wondering why I decided to blog about such a small issue which is not a small one instead we need to spread and educate people not to get involved in Content Scraping. I don't wanted to waste my own and my reader's time, but since I knew there are many Online Marketer & SEO Professionals across the country who religiously follow and read my blog, it will be worth sharing my latest experience with you all. I have been victim of such nuisance many time's before where people steal, copy, scrap my resume, my work and showed to world as they own it (I knew how to deal with all such Content Scrapper's & Content Theives). All these 8 years of my journey in SEO industry I came across many SEO's who has copied my blog articles, crunchbase profile's details, presentations & my detailed online resume content without my consent or written permission. I had encountered with this many time's and had a long battle with them in a professional way to compel them remove online properties (content) owned by me and don't to display up my work under their name. I knew Google is their for all such theives...still it hurt's when some sneaky people does this knowingly or unknowingly. Today one more name added to this list and this time the gentlemen is Mr Amar Sontakke (Gentelmen??? ), you must be wondering now what's the issue?...The issue or rather I would say the problem is that Mr. Amar Sontakke has stolen my Linkedin Profile Summary, showing the exact same under his Linkedin Profile. 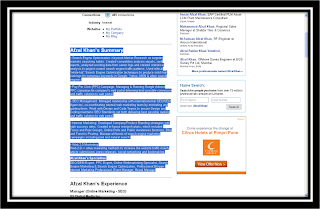 Screenshot's below, you can compare linkedin profile of mine ie.Afzal Khan and the So Called SEO Gentlemen Amar Sontakke All what he has copied is highlighted....My Linkedin Profile has got Google PR 2 while his profile PR is Zero which itself tell's the whole story of who's content is original, genuine and older. 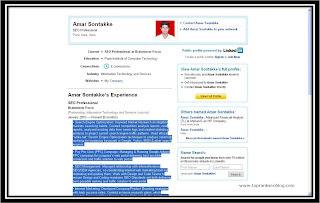 The Profile summary which you are showing at your Linkedin (http://in.linkedin.com/pub/amar-sontakke/21/257/65) is copied from my profile, it's a an infringement and illegal. Stop being copy cat and remove all what you had copied from my profile (http://www.linkedin.com/in/afzee). It's a first and last request warning whatever.....If you'll not remove it in next 2 days..I'll report your profile and take action to take it down. So be professional and act accordingly. Sorry boss i have lost my linkedin pwd so i cant change it right now.. by the way i didn't copied your content. Its just a coincidence that our profile is matched. but as your yelling this much i will change it as i will find my pwd. I am having enough proof's to justify my points. Still in a good harmony I have sent request first....later it's the time will tell you who is genuine or not. Don't tell me you lost pw and don't know how to recover it....either you are just dumb who don't know how to recover PW....or simply acting like a novice...how come you have an SEO expert??? Be honest and accept things if you are culprit....It's not an big issue for me but definately such things are un-tolerable, un-avoidable and not all expected from professionals. Oh bummer.. i have lot work to do please don't disturb me again.. I am changing my profile because i don't want to mess with people like you who first bring me to their level and then beat me with their experience.. And i would like to warn you don't try same trick again with my new profile.. and stop yelling now.. Awesome...he has lot of work to do and don't want to mess with people like me...on top he has warned me not to apply same trick with his new profile....have I scraped content from his profile?, he claims himself as an SEO, doesn't he know about SEO best practice or aren't he has been taught not to plagraism....I can laugh only :-)...I think he is real dumb...Moron and I decided not to respond him who doesn't have any professional ethics so ever. Such people exist who always remain involved in doing un-ethical things. So guys be always ready to encounter with such people who first commit mistakes and on pointing their fault they will never accept it, instead they made you feel like you were the real Culprit.....blah...blah...A simple "SORRY" would have worked, but this gentlement has his own rule's. Anyways SORRY Dude it was all my fault why I created such an impressive profile summary which made you to use it & my apologies and Big Sorry to share it this with everyone...LoL.!!! Be carefull with all such content theives, content scrappers & At last my sincere request to all who are entering this Global Online World!... "STOP Stealing Online Content Properties", If you have liked something give credit to original source or take owner's permission before using anything online. I hope you all have enjoyed reading this simple yet very informative article and found it sheer useful. Please share your views and spread words about this with everyone in your network. Fight against plagarism and content scrapper's...Show your Love by Tweeting, Facebook Like or use comment box below to share what you think? If you liked this blog article please Subscribe to TopRankSEO Blog RSS feeds, to get all the latest Google SEO, Analytics, Social Media, Online Marketing and Search Engine News or Alternatively meet TopRankSEO blog at Facebook. Response from Social Mediaspehere about such Content Thieves. Via Twitter DM received from @WebMeter - That is some naughty person. You were right to put a stop to that. @Afzal: Very True! Already With you! @Tabrez Firoz - hey afzal, this is common nowadays, and especially in India where numerous number of so-called seo experts have emerged from nowhere. They fail to understand the value of uniqueness and just go by the copy-paste mindset, which is sad. @Afzal Khan to ‎@Tabrez - Yeps the growing # of SEO's in India are following this route, but there should be some voice raise against it to educate the new SEO entrant's. Thanks for your support...plz spread words!